Progressive discipline is a process for dealing with job-related behavior that does not meet expected and communicated performance standards. The primary purpose of progressive discipline is to assist the employee to understand that a performance problem or opportunity for improvement exists. The process features a series of increasingly formal efforts to provide feedback to the employee so that he or she can correct the problem. The goal of progressive discipline is to get the employee's attention so that he or she understands that employee performance improvement is essential if they want to remain employed. The process of progressive discipline is not intended as a punishment for an employee, but to assist the employee to overcome performance problems and satisfy job expectations. Progressive discipline is most successful when it assists an individual to become an effectively performing member of the organization. Progressive discipline is used most frequently with hourly or non-exempt employees. Salaried or exempt employees, under most circumstances, never move beyond the written verbal warning stage because they either improve or seek employment elsewhere. Failing that, progressive discipline enables the organization to fairly, and with substantial documentation, terminate the employment of employees who are ineffective and unwilling to improve. Typical steps in a progressive discipline system may include these. Counsel the employee about performance and ascertain his or her understanding of requirements. Ascertain whether there are any issues that are contributing to poor performance. These issues are not always immediately obvious to the supervisor. Solve these issues, if possible. An example of an issue is the employee doesn't understand the goal of what he needs to contribute. A second example of an issue in a poor attendance performance situation is that the employee is taking time off to assist his sick mother. He didn't tell his manager who would have referred the situation to Human Resources for addressing as FMLA eligible time off. Verbally reprimand the employee for poor performance. Tell the employee that you will document the next steps in progressive discipline and that termination can result at any point in the progressive discipline process when the employer believes that the employee is unable to improve despite repeated warnings. Document the conversation. Provide a formal written verbal warning in the employee's file, in an effort to improve employee performance. Continue progressive discipline as long as you believe the employee is making efforts to bring his performance on track. Provide an escalating number of days in which the employee is suspended from work without pay. Start with one day off, escalate to three and then escalate to five. End the employment of an individual who refuses to improve. Are you interested to know how you can communicate effectively during disciplinary action you are taking to correct an employee's behavior or performance? In this example, the employee's coworkers have often experienced the brunt of the impact of the employee's absenteeism or failure to contribute. They want to know that you're taking the matter seriously and working to correct the behavior. Nothing hurts the morale of your contributing employees more than seeing no action taken to correct the actions of poorly performing employees. You can't share what you're communicating because of employee confidentiality, but here's how you can approach the conversation with the non-performing employee. Discipline is best when you have personally witnessed the behavior, so make a genuine effort to that end. Keep in mind that your presence can change the employee's behavior and so you may never see the actions that the coworkers see. Revisiting the subject of employee discipline, specifically progressive discipline, this revised disciplinary action form is straightforward and addresses employee actions in behavioral terms. Managers receive guidance via the questions on the form to provide actionable performance feedback and suggestions for improvement to the employee. 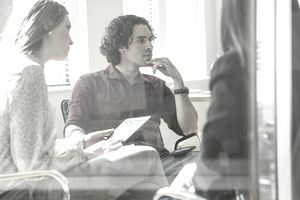 The first step in communicating disciplinary action is to take the employee to or set up a meeting with the employee in a private office. If you anticipate difficulty, and always at the stage of written verbal warning, it's smart to ask an HR person or another manager to sit in on the meeting so that there is a third party witness present. In a union-represented workplace, the employee may also ask his union rep to attend the meeting. The rep is usually a second onlooker but may ask questions to clarify or for examples that illustrate the behavior. In a nonrepresented workplace, an employee can request that his own witness, possibly a coworker friend, also attend. Telling an employee, "You have a bad attitude," gives the employee no information about the behavior you want to see the employee change or improve. Better? Say, "When you slam your parts down hard on your workbench, you risk breaking the part. You are also disturbing your coworkers. The noise bothers them and they are concerned about their safety if parts fly through the air. "Your actions also cause your coworkers to stop working to see what is happening. Loud noises are disturbing in the workplace. Your coworkers feel the need to find out whether they are in danger when strange sounds happen near their workstations. "You can consider this your verbal warning that the behavior needs to stop. I can understand that the work sometimes frustrates you and that you let pent-up impatience out by slamming parts down on your workstation. But, the behavior needs to stop because of its impact on your coworkers. "You can take a look at the progressive discipline policy in your employee handbook. The next step following this meeting is that I will document that I gave you a verbal warning and I will ask you to sign the document. Your signature doesn't mean that you agree with the document. "It means that you have seen and read the document and that you are aware that HR will file it in your personnel records. "Finally, George, the next steps if you continue these actions is a formal written verbal warning and then suspension without pay. At the point of the formal written verbal warning, the company will decide whether you are interested in changing your behavior. If the answer is, not likely, we will terminate your employment. Do you understand?" Just as you are as specific as possible when you praise or recognize positive employee behavior and contributions, you are just as specific when you ask an employee to stop or improve negative actions. Your effort to describe the specific behavior that you want to see corrected makes the results you want to see more clear to the employee. Of course, the employee may ask questions and make comments about the situation throughout the meeting. He may deny that the situation is occurring and tell you that his coworkers are out to get him. This reaction is why, whenever possible, you will want to have witnessed the behavior yourself rather than enforcing discipline based on coworker opinions. But, as mentioned earlier, it's not always possible. On a final note, even if you have a written progressive discipline policy, you need to make sure that you state that you will apply it only in certain circumstances. Retain your right as an employer to skip all or some of the steps in certain circumstances. In one small manufacturing company, for example, the following actions occurred. Two employees (who were dating outside of work) held a screaming match in the middle of the plant in view and hearing of most other employees. All work by over a hundred people stopped, and then, of course, the screaming match took up hours of the employees' attention and conversation. Neither employee had ever had any disciplinary action taken against them. But, in this instance, because of the widespread impact of their actions, they were each given a week off—unpaid— to think about proper behavior at work.